AURORA, Colorado (CNN) -- Gun shops across the country are reporting a run on ammunition, a phenomenon apparently driven by fear that the Obama administration will increase taxes on bullets or enact new gun-control measures. 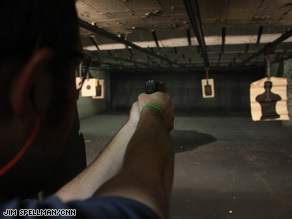 Ron Cardwell fires his 9 mm semiautomatic at a paper target at a range in Aurora, Colorado. "In the last two months it's gotten very, very difficult to find ammunition," says Richard Taylor, manager of The Firing Line, a gun shop and shooting range in the Denver, Colorado, suburbs. "There are a lot of rumors floating around that the present government would like to increase taxes on ammunition. I think [there is] just a lot of panicked buying going on." While campaigning for the White House, Obama supported re-enacting the now-expired ban on assault weapons. But there is no indication that the administration will take up that measure -- or any other gun-control initiative --anytime soon. Nonetheless, some gun owners aren't taking any chances. Two weeks ago, The Firing Line was forced to impose a four-box-per-customer limit on ammo. Before that, the shop was selling 10,000 rounds of 9 mm handgun ammunition a day. Some calibers of ammunition have been unavailable for months. "Currently no .380 ammunition -- I haven't seen any for about four months ... .38 special, it's been at least a couple of months," Taylor says. "It's just that there's been a huge demand and it's far outweighed supply right now." Taylor says plenty of people are still coming to the range to shoot, but are gun owners hoarding ammo? "People are buying cases or whatever they can get their hands on and putting it away, absolutely," he says. "The only way that this shortage can have to do with it is that people are buying and hoarding." Karl Roos, a physician, stopped by the range to do some shooting with his Smith and Wesson .357-caliber Magnum, using some rounds from his personal stock of ammo. "I have yet to see .38 special or .357 Magnum ammunition on the shelf. The stuff I'm shooting I've had for several years. I just haven't seen it for the last several months," says Roos, who adds he is always on the lookout for fresh sources of ammo. "As I'm doing the rounds of the local stores that carry ammunition, if I see something on the shelf I'll buy it." "I'm not too worried about things being banned or anything like that," he says. But he notes that many of his fellow gun enthusiasts are scared: "There's definitely a lot of fear." Jim Minardi, a gun dealer in Lakewood, Colorado, says only a few people are actually hoarding. But they are buying up so much ammo that there isn't much left on the shelves. "The minority of our customers are stockpiling ammunition," Minardi says. "The majority are standard shooters buying what they can." Wal-Mart is one of the largest ammo dealers in the United States. In an e-mail exchange, a Wal-Mart spokesman confirmed that ammo sales have been brisk. "Some Wal-Mart stores have experienced an increase in demand for guns and ammo and for those locations, we are working closely with suppliers to replenish shelves," says William C. Wertz, the discount chain's divisional director for public affairs and government relations. "In some situations where demand is high, so that we can better serve all customers, we will place a limit on the amount of a product that can be purchased." "It's no different with ammo than other products (toilet paper, batteries, etc.) that may be in short supply for one reason or another." Each year U.S. ammo manufacturers make about 8 billion rounds, according to the National Shooting Sports Foundation, the trade association for the firearms and ammunition industry. Current production data won't be in until late May, but the foundation expects the numbers to be way up. "In order to keep up with demand for ammunition, manufacturers are working at full capacity, 24-7," says Ted Novin, an NSSF spokesman. "Currently demand for ammunition is outpacing supply." Novin says he believes the reason is clear. "The increase in demand for firearms and ammunition is largely attributable to gun owner concerns regarding the current political climate," says Novin, referring to the Obama administration and the Democrat-controlled Congress. "Many of the lawmakers in power have a long history of supporting legislation that violates the Second Amendment rights of law-abiding Americans," Novin adds. "Gun owners recognize this and are reacting accordingly." Ammunition manufacturers have been scrambling to keep up with demand. "Here at Hornady Manufacturing we are breaking our own production records in an attempt to keep up with customer demand. We have added extra shifts, machinery and we are also in the process of expanding our manufacturing plant." "Winchester Ammunition, like other ammunition manufacturers, has seen the demand for our products increase significantly since last fall. To meet that increased demand, our operations are running 24 hours a day, 7 days a week." Andrew Arulanandam, communications director of the National Rifle Association, says the "unprecedented ammo shortages are widespread, and they affect small and large retailers." "We have heard from members across the country in cities and in small towns from California to Maine," Arulanandam says. "There is a fear that Congress or the new administration will push for a firearm or an ammunition ban, or for a significant increase in excise taxes on firearms and ammunition. We hear this from hunters, target shooters and even from first-time gun owners who fear that there will be an effort to incrementally curtail and eventually dismantle this freedom." Back at The Firing Line's gun range, pilot Ron Cardwell is working on his target shooting with his 9 mm semiautomatic pistol. He loves to shoot and hopes the ammo crisis ends soon. "I have three or four boxes of 9 mm left at home and a couple of boxes of .45," he says. "I'm just buying as much as I can whenever I can."